‘Source To Image’ is a means of creating Docker images by depositing source code into a separately-defined Docker image that is responsible for building the image. You may be wondering why such a build method was conceived. The principal reason is that it allows application developers to make changes to their code without being concerned with the details of Dockerfiles, or even Docker images. If the image is delivered to a aPaaS (application platform as a service), the individual engineer need not know about Docker at all to contribute to the project! This is very useful in an enterprise environment where there are large numbers of people that have specific areas of expertise and are not directly concerned with the details of the build. Once the process is set up, the engineer need only be concerned about the changes they want to make to their source code in order to progress them to different environments. This process can easily be plugged into any existing software delivery process, and use almost any Docker image as its base layer. This method of building can be faster than Dockerfile builds, as any number of complex operations can be added to the build process without creating a new layer at each step. S2I also gives you the capability to re-use artifacts between builds to save time. Since source code and Docker image are cleanly and strongly separated, developers can be concerned with code while infrastructure can be concerned with Docker images and delivery. As the base underlying image is separated from the code, upgrades and patches are more easily delivered. This process can restrict the operations performed in the build to a specific user, unlike Dockerfiles which allow arbitrary commands to be run as root. The structure of this framework allows for a shared ecosystem of image and code separation patterns for easier large-scale operations. To help ensure a consistent experience you can use a maintained environment to develop your S2I build image and project. If you are running in an selinux-enabled environment, then you may have problems running docker within a container! This could be on built elsewhere and placed on GitHub (for example), but to keep this example simple and self-contained we’re going to create it locally in our S2I development environment. As mentioned above, our source code consists of one shell script. As a trivial example, this simply outputs ‘Hello World’ to the terminal. cat > app.sh <<< "echo 'Hello World'"
This Dockerfile uses the standard openshift base-centos7 image. This has the ‘default’ user already created within it. It then changes ownership of the default openshift code location to the default user, copies the S2I scripts into the default location for an S2I build, snsures the S2I scripts are executable and makes the builder image use the pre-created ‘default’ user by default. Next you create the assemble script, which is responsible for taking the source code and compiling it ready to run. Below is a simplified, but feature-complete version of this bash script for you to use. It runs as a bash script, exiting on any failure (-e), copies the application source into the default directory and builds the application from source. In this case, the ‘build’ is the simple step of making the app.sh file executable. docker build --no-cache -t sti-simple-shell . If you run ‘docker images’ you should now see an image called sti-simple-shell stored locally on your host. These three are located in one place in this walkthrough, but the only one that needs to be local to our run is the sti program. 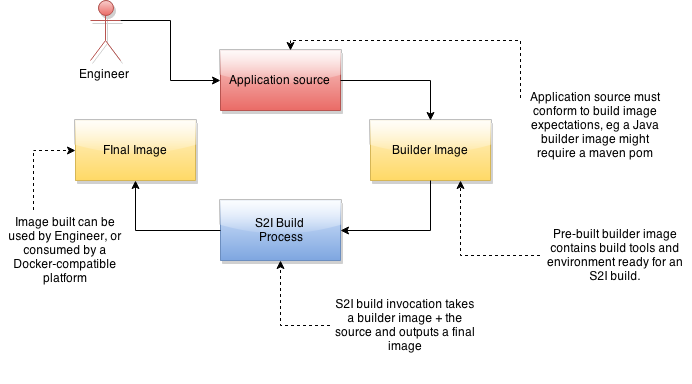 The builder image can be fetched from a registry, and the source code can be fetched from a git repository such as GitHub. cat > app.sh <<< "echo 'Hello S2I!'" This post demonstrated a simple example, but it’s easy to imagine how this framework could be adapted to your particular requirements. What you end up with is a means for developers to push changes out to other consumers of their software without caring about the details of Docker image production. Other techniques can be used in combination with this to facilitate DevOps processes. For example, by using git post-commit hooks you can automate the S2I build call on checkin.